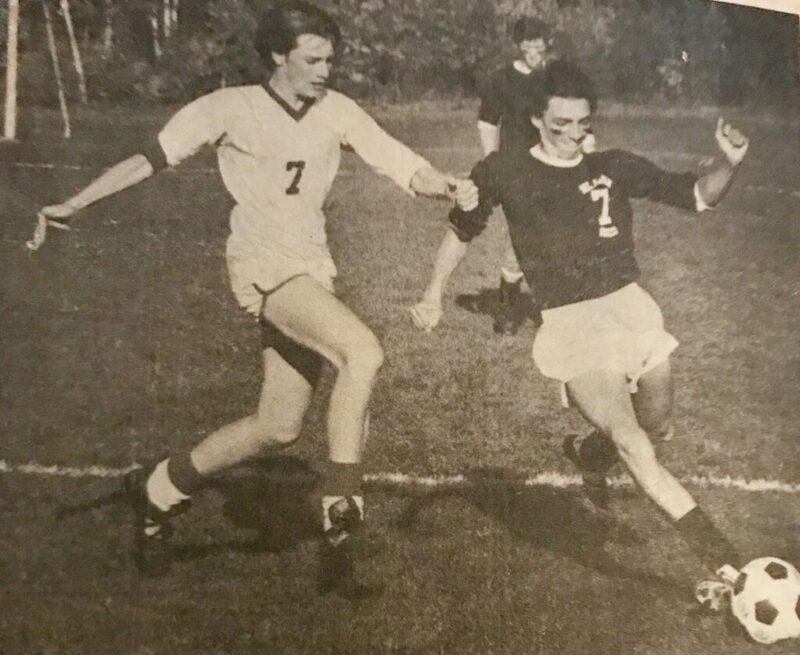 Michael Sauschuck, a former U.S. Marine and police chief, whose easygoing demeanor is tempered by his genuine humility and dedication, never thought of himself as “anything special” as a high school soccer player. But his teammate Darren Allen remembers Sauschuck for his invaluable leadership skills and inspirational voice for the 1987 Mt. Abram boys soccer team. 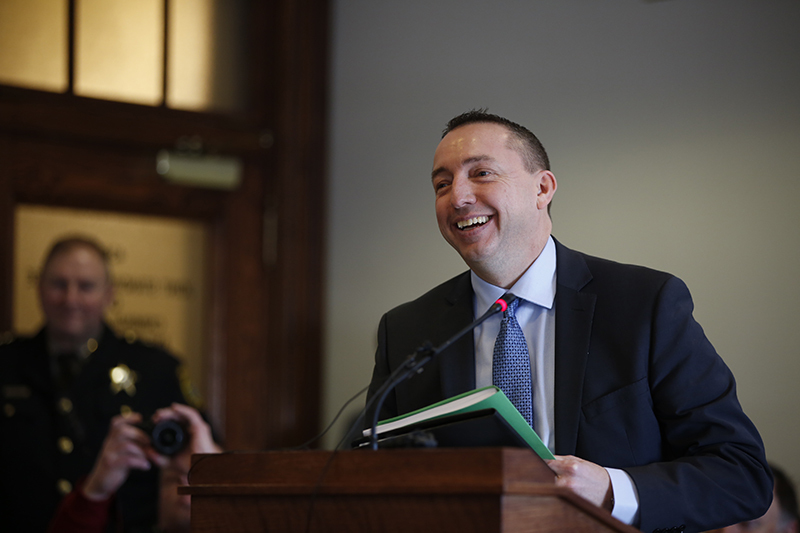 Sauschuck’s take-charge attitude has served him well as a cop, jarhead and now as the newly appointed Maine Commissioner for Public Safety in Gov. Janet Mills’ administration. Mills and Sauschuck traveled in the same the circles in law enforcement. “She was the attorney general for a number of years while I was a police chief,” Sauschuck said. 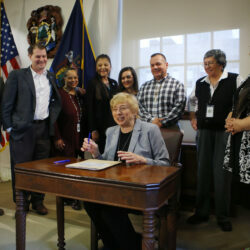 “She is also a born-and-bred native of Farmington. 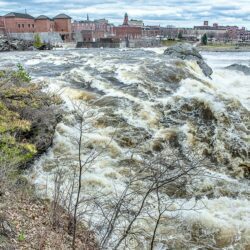 Mills is confident that Sauschuck and Randy Liberty, who was confirmed in February as the next commissioner of the Maine State Prison, will have a positive affect in their jobs. “The fundamental charge of any government is to protect the safety and well-being of its citizens,” Mills said in a statement. “With decades of experience, Mike Sauschuck and Randy Liberty are leaders of the highest order who are well-positioned to fulfill that critical mission and who are well-respected across the board. 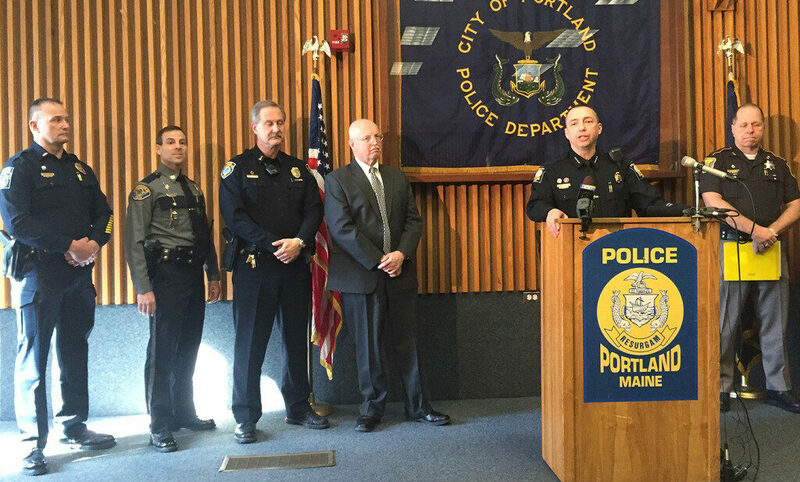 Sauschuck, a former Portland police chief, downplays his role on the soccer team, but applauds his teammates for their tenacity and talent. “I don’t know if I was a great soccer player, but I did play soccer,” he said. “That was my high school sport of choice and I enjoyed it. It was a great team. I think you learn a lot through team sports, no matter what the sport happens to be. “We went to a couple of tournaments. We did pretty well and had a pretty good team. Obviously, Darren was an incredibly gifted and a great goalie, and we had some really talented players as well. But Allen begs to differ with Sauschuck’s self-evaluation of his athleticism and believes the former police chief made a huge contribution to the soccer team. “Mike was one of our leaders in the first season in the Mountain Valley Conference in 1987,” Allen, who is the current Mt. Abram boys soccer coach, said. “I believe he played outside back. He may not had been the best soccer player on the team, however, he was a leader of that team. This was the first year our seniors were in a conference. Allen said Sauschuck’s leadership played an important role in some of the Roadrunners’ biggest games. “I remember a night game in Rumford (it was Rumford High School back then),” Allen said. “It was a huge game for us because it was the first time many of us played under the lights. We also needed to win to keep pace with Telstar in the win column. Sauschuck believes athletics can make a difference in a child’s life, especially on the academic side of high school. “I think athletics are more important to kids, especially when you are in a rural county, where it kind of brings you together,” he said. “It allows you to work as a team, I think that work-ethic approach and that team atmosphere is invaluable as a skill set for later in life. “I think they (sports) allow kids to be focused. It focuses on having the privilege of playing sports and you need to do these other things. According Allen, Sauschuck was also sharp student. When Sauschuck graduated from Mt. Abram in 1988, he wasn’t sure about heading off to college so he turned to Uncle Sam and enlisted in the United States Marines. “It was something that I wanted to serve our country, and I was looking to be a member of a team,” Sauschuck said. “I was looking to something that I could always be connected to. Sauschuck said he started as a grunt and then became an M60 machine gunner before taking on embassy duty for three years. “I was stationed in Moscow and I was stationed in El Salvador for various times,” he said. After his five-year stint with the Marines and seeing the world, he chose a career in law enforcement and also earned a college degree in criminology in 1993. “I ended up Portland and I was going to USM,” Sauschuck said. “When I was going to college, I was a reserve police officer at Old Orchard Beach for a few years. Then Old Orchard hired me full-time and I stuck around for a couple of months. Great PD, good people, and I also applied for Portland. They called me and I made the move in 1997. Sauschuck continues to move forward in his professional career, but you can bet those memories of the old school yard and playing for former Mt. Abram coach Art Potter will surface every now and then. Potter remembers Sauschuck as a determined and diligent student. “I had him for four years in high school,” Potter said. “I kind of follow him and seen him on TV and whatnot, and congratulated him on his accomplishments. “He has just been just a good man and student. I was physical education teacher and worked with him as a student. He was often in the gym when he could get some free time and was always joining in different activities. Just a real good guy and a positive guy. Sauschuck has made that kind of impression on people who helped the former U.S. Marine move forward in life.